One hour a week, time decided collaboratively by enrolled families. The Nido Parent-Infant Program will resume September 2018. Interested families as well as community members and early childhood professionals are welcome to schedule an appointment to visit the Nido by emailing or by calling 505.550.3852 (leave a voicemail). Four-month-old Hero and five-month-old Audrey lay side-by-side on a floor quilt. It was their first time meeting one another. Hero stares at Audrey, and then reaches out towards her, trying to get Audrey's attention, trying to make contact. She gently brushes against Audrey's arm. Audrey turns toward the sensation and the two, arms withdrawn, look deep into each others' eyes in silent communication. Hero reaches out to Audrey again. This time, Audrey returns the reach. Their hands meet briefly, gently. They continue to make eye contact and exchange gentle touches. A new friendship is forming. 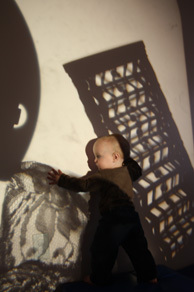 In Reggio-inspired practice, children are believed to be born as peace-loving and friendship-seeking individuals. They have a right to human interaction and the forming of relationships with peers and adults outside their nuclear families. Stories from Reggio Emilia, Italy show us time and time again how the amazing is made possible when even the youngest of children meet regularly to form loving and stimulating learning communities with a predictable group of peers. 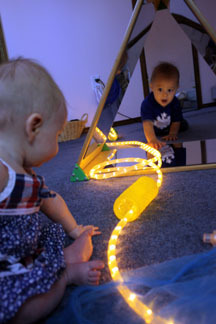 Five-month-old Hero watches with fascination as eleven-month-old Elijah independently explores the infant room. She sees him bear crawl around the room, over, under and through obstacles. 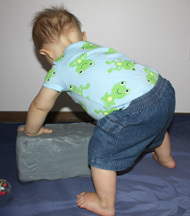 She sees him pull himself up to a standing position and let go briefly. He crawls over to her and touches her on the shoulder. "Baby" he squeaks. She recognizes him as a baby too, despite his larger size and more advanced physical skills. More than recognition, she seems to identify with him when after processing what she has witnessed over a good night sleep, she amazes her parents the next day by trying all sorts of things she's never tried before. Though she is still a long way from crawling, pulling-up or speaking, Hero manages a potpourri of improvised movements that allow her to unconventionally climb over her parent's laps and up their chests. She also experiments with a number of new sounds, including a two syllable sound that appears to be an attempt to order the dog to come by calling her name. The few stories shared here were collected during the formation of Rosalie's Nido. In the tradition of Reggio schools, documentation of the children's explorations and interactions is essential to the functioning of the learning community. The photographs and anecdotes allow the adults to better listen to the silent voices of the littlest citizens in order to better understand how to support the relationships and research of the little ones. 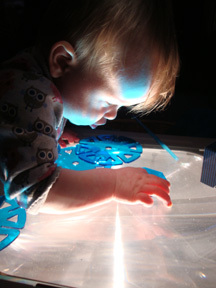 Additionally, the documentation allows the infants themselves to begin to engage in reflection as they see themselves engaged in learning endeavors with those in their learning community. This documentation is also compiled and preserved as a memory of the children's time at Rosalie's Nido. Twelve-month-old Elijah is excited to see six-month-old Hero again for their weekly play date. He sits by her on the floor and picks up a rattle. Elijah proceeds to attempt to teach Hero to use the rattle. He hold it up in front of her and deliberately shakes it by flicking his wrist. He then pushes the rattle against her hand. She closes her hand around the rattle, but when Elijah lets go, she lets her hand fall to her side, the rattle still in it. She is wholly consumed with staring at her friend. Elijah is not deterred. He holds his hand up in front of him again, as if he is holding the rattle, and repeats the flicking of the wrist. Still Hero stares and does not use the rattle. Elijah takes the rattle out of her hand, holds it up in front of her and shakes it again. He then places it again in her hand and waits for her to shake it. When she does not, he crawls off to find another rattle. �Later, Hero recovers from the awe of her older friend. Her body and hands come to life, determined to play with Elijah who is opening and closing the door of a wooden mailbox. Supported by her mama, she reaches out towards Elijah to feel his hair, thin and wispy as her own. Though she pulls, he does not protest. It is a gesture of friendship, not hostility. She also reaches for the wooden door as well as the envelopes and balls that Elijah is placing in the mailbox. Together they remain engaged for some time. For adults, a this is wonderful opportunity for families to meet other families with children of the same age, to make friendships and to make contact with other adults during what might otherwise be long hours alone with a young child. Adults share parenting tips with one-another and delight in watching their child's interactions and learning in a different and highly social environment. 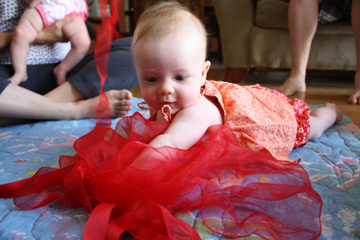 As a Reggio-inspired program, the Nido is a place for adult learning as well as for the learning of infants. The facilitator supports the adults as they learn from the children through observation and documentation. Listening is highly valued at Rosalie's Nido. This listening takes the form of thoughtful conversation, observation and documentation which in turn allows for great reflection as the staff and families work together to meet the challenge of creating joyful and stimulating experiences for the Nido's community of learners (adults and children) as they pursue learning projects together. These experiences may then continue as your child moves on to the Cooperative School.